The beautiful Newly furnished (June. 2010) family Villa 1800 Sq. 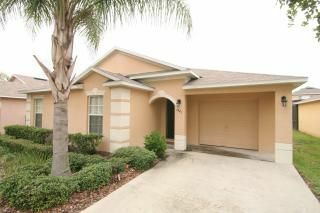 Ft. has 5 Bedroom / 3 Bathroom with an oversized pool, conveniently located in the community of Silver Creek, Clermont, cross section of east 192 and north 27 , just 9 miles to the main gate of Disney World. After a long day at the parks, relax by the covered pool (which can be heated). It is fully screened to keep the bugs out but allows the sunshine in. The kitchen is fully equipped with an open bar, a beautiful separated dinning and a breakfast table. Phones, Cable TVs, a DVD, radio/CD player, Washer and dryer, Bed linen and towels are provided. High chair, crib, and stroller are also available. local and domestic long distance phone call is free. Come and enjoy our freshness and luxury vacation home! perfect property for what we were looking for. pool was well looked after. rooms were a good size. could use updating. more outdoor chairs-lounges would have been nice. house is in a good location. enjoyed our stay. Good property in a quiet neighborhood very relaxing. Hope all of our guests enjoy their stay ! The house easily met all of our needs. We had three families staying and the set up was perfect. The house was clean. Thank you! Thank you very much and welcome back in the future travel ! Thank you and welcome back in the future travel ! Excellent location close to everything . Very spacious for a large group or family . Hope you had a great time and welcome back in the futrue ! • Nearby Attractions: Situated very close to Disney theme parks, Magic Kingdom, Epcot, MGM studios, Sea World and many more. The best shopping in Florida can be found at the Florida Mall (35 mins) and the Mall at Millennia (40 mins). There are a number of excellent golf courses including Reunion Resort and Champions Gate within minutes of the villa. • Shopping and Dining: can be reached by driving for 2 minute(s). Located only one mile away from Route 192 with many restaurants and shopping centers. A Super WalMart is within 0.5 mile for your daily grocery needs.